Over 19.000 persons have already raised their voices, become one of them now! Press Release – EWL 50/50 Campaign for Democracy More Women in the European Parliament, What about EU Top Jobs? Plus de femmes au Parlement européen, qu’en sera-t-il pour les autres postes européens de haut niveau ? The European Women’s Lobby 50/50 Campaign for Democracy, running since September 2008, published on 20 May 2009 a Gender Audit Report of Electoral Lists and Political Programmes, in view of the European elections of 4-7 June 2009. The report concludes that most political parties do not consider equality between women and men as a key priority in light of the European elections 2009, despite the strong competence of the European Union in the area. You are invited to read the whole REPORT here (EN); (FR), as well as the PRESS RELEASE (EN); (FR); (GR) and the SUMMARY (EN); (FR); (DE) . The EWL conference 50/50 – No Modern European Democracy without Gender Equality aims to answer questions on the representation of women in the newly elected European Parliament and for the other EU to jobs through a panel of very prominent women politicians and the contribution of members of the EWL across Europe who have been working towards parity democracy through the EWL 50/50 Campaign. Please click here for more information about the programme and to register. La conférence 50/50 du LEF– Pas de démocratie européenne moderne sans égalité femmes-hommes aura pour objectifs de répondre aux questions sur la place des femmes au sein du nouveau Parlement européen et pour les autres postes européens de haut niveau, grâce à un panel de femmes politiques célèbres et à la contribution des membres du LEF dans toute l’Europe, qui ont travaillé en faveur de la parité dans le cadre de la Campagne 50/50. Cliquer ici pour plus d’informations sur le programme et pour vous enregistrer. Do you think that women and men should be equally represented in all European Union institutions? Join the 50/50 Campaign! SIGN THE PETITION and TAKE ACTION! 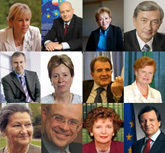 Many prominent persons from across Europe have already given their wholehearted support to the EWL 50/50 Campaign.